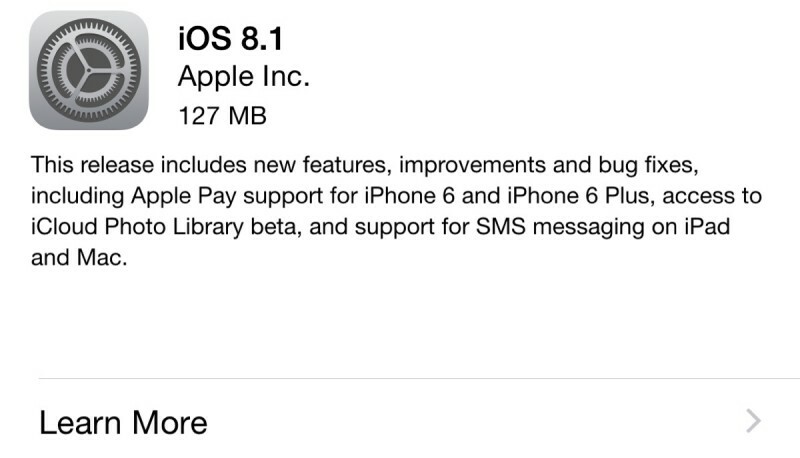 Apple today released iOS 8.1, its first major update to iOS 8. First seeded to developers at the end of September, iOS 8.1 brings quite a few significant features to the operating system. The update activates Apple Pay, enables Yosemite users to access Continuity features like SMS relay and Instant Hotspot, offers all iOS 8 users access to iCloud Photo Library, fixes several bugs, and more. iOS 8.1, build 12B410 for iPads and 12B411 for iPhones, is available immediately as an over-the-air download and after updating, it will allow iPhone 6 and 6 Plus owners to access Apple Pay, Apple's new payment service. With Apple Pay, the iPhone 6 and 6 Plus can be used to make payments in both retail stores that support NFC and participating apps. Apple has also released Apple TV software 7.0.1. Also included in iOS 8.1 is support for SMS relay, a Continuity feature designed to allow Macs (running Yosemite) and iOS devices like iPads to receive SMS messages routed through a user's iPhone. Instant Hotspot is also enabled through the iOS 8.1 update, letting Mac users remotely activate the Personal Hotspot capabilities of an iPhone when two devices are near each other. Along with those major features, iOS 8.1 reinstates the Camera Roll, which was removed with iOS 8, and it gives all iOS 8 users access to iCloud Photo Library, Apple's new cloud-based photo storage solution. The removal of the Camera Roll turned out to be a controversial decision, with Apple opting to re-add it after iOS users asked for the feature to be returned. iOS 8 has not been Apple's smoothest software release, with users encountering quite a few bugs in the operating system. While multiple issues were fixed with iOS 8.0.2, released in late September, iOS 8.1 fixes several other bugs, including a problem that caused some iOS 8 users to have trouble pairing their phones with their Bluetooth devices. According to release notes, iOS 8.1 also fixes several other complaints users have had about iOS 8, including problems connecting to Wi-Fi and issues with screen rotation. Oh I don't think so, Apple. I think I'll sit this one out for a few hours. The last time I downloaded an update so quickly, my phone stopped functioning as a phone. I will let others try this first, and then maybe I'll feel it is safe to proceed. I wonder how many people will go to Walgreens/McDonald's today just for Apple Pay. I am taking my Apple TV to McDonalds today! Just added a Citi card to ApplePay (done via passbook). It had to send a text with an activation code on file to verify my identity, but the process took about 2 minutes. About to go try it on a vending machine at work that supposedly takes NFC. Report back in a few minues. Held my iPhone up to the NFC reader on the vending machine and my screen automatically turned on and asked me to authenticate with Apple Pay. I tried the Citi card twice, and it was declined (yes, I have enough available credit for a $1.60 purchase so not sure why) so maybe they're still working out the bugs. I added a Chase card and it worked. It's pretty neat, but to be quite honest, I'm not sure if it's any faster than swiping a card. And to clarify things: THIS WAS A REGULAR NFC-ACCEPTING SODA MACHINE. No special requirement for the merchant to support ApplePay. For anyone who still doesn't believe that Apple Pay works anywhere NFC is accepted. Did you guys see Dynamic Vending on the list of merchants accepting ApplePay on apple.com? Me neither. I just don't get why it's a larger file if I have a beta installed already. You'd think the opposite would be true? A 2.2gb update is huge on my 16gb 6 plus! 16GB 6+, that was your first mistake. Best update I have found in 8.1 so far. Edit: I have an iPhone 6 with no bending issues. Done! 8.1 on my 5s! Strange... Apple Pay didn't work for me at MacDonalds. I had to borrow money from the guy standing behind me to pay for that cup of Coke. 5s doesn't have NFC, it won't work.